Description: Making its way to Trenton, Mi., BNSF 8960 & 9597, lead train N84126, eastbound at Pine Jct, in Gary, In., after raining all night and still under stormy skies, but in a single moment of brightness, as it charges on. 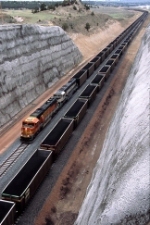 Description: Loaded Palos Coal train nears Tennessee Yard. Description: BNSF Northbound Empty Coal Train passing through Jasper, Al. on their way back to the Powder River Basin in Wyoming for more coal loads for Plant Miller in West Jefferson, Al. Title: "Power of tomorrow, Tonight"
Description: A single BNSF SD70MAC lays over on the West leg of the wye at New Brighton, as clouds and airplanes pass through the night. Description: Wide Angles are fun! Description: A westbound ore empty hits the crossing on a gloomy March day. Description: A BNSF oil train rolls through Dallas on the way south out of town. Description: After meeting N95631, westbound E94502 eases out of the siding at W.E. Brighton led by BNSF 8960. Title: BNSF 8960 Works dpu past a grain in the siding.